Does Sweden Face Its Most Important Election for Decades? Two boys idly pass a football back and forth, dodging some of the thousands of chairs laid out on an indoor AstroTurf pitch. Not far away, several children chase each other up and down while one of them is forced by her father to give up a handful of sweets she has taken from stalls nearby. A rock band starts playing and a huge choir soon joins in, but this is no concert. Instead, the event for 2,300 people in a cavernous sports hall in Vårgårda, a small town in the rural heart of Sweden, is something far stranger. It is a church service that also happens to be the biggest election event in the country. As the country prepares for elections, why are all eight leaders of its main political parties beating a path to this small town of 5,000 people an hour into the forest outside Gothenburg? Bonette Bryngelsten, a 32-year-old dance teacher who lives in Vårgårda, provides part of the answer. As she pushes a pram next to the campsite that adjoins the hall, she tells me she has come to hear the Moderate Party (Moderaterna) leader Ulf Kristersson talk, even though her baby is only ten days old. “I feel like you get a more personal meeting with them, you get to know them better,” she explains. The Vårgårda interviews follow a set format. Each party leader is the focus of a different evening’s proceedings; as there are eight political candidates for prime minister this year, there are eight events in total. The running order is identical each time but the questions change and, in a bizarre twist, one of the priests sings a pop song that has been specially chosen for each candidate based on their ideas. Kristersson tells me the interview will, by some distance, be the biggest campaign event he does all election. “I like this kind of discussion: politics in a non-political way, we can discuss values,” he says. Values are at the heart of this election, judged by many to be the most crucial in decades. A combination of worries about the future of Sweden’s famously generous welfare state, immigration and the spread of populist rhetoric is causing a historic realignment in the nation’s politics. The centre-left Social Democrats (Socialdemokraterna) have long seemed to be one of the most impressive election machines in the western world, coming first in every election since 1917. But now the party’s popularity is in sharp decline, with support having nearly halved in the past twenty five years. At the last election it recorded its second-worst result in a century and went into coalition with the Green Party (Miljöpartiet de Gröna). However, it is not Kristersson’s mainstream centre-right party reaping the benefit, but the populist Sweden Democrats (Sverigedemokraterna). A number of national news stories have dented Sweden’s self-image: from concern around huge cost overruns at the Nya Karolinska hospital in Stockholm — a controversial public-private partnership project whose construction costs have risen to about 60 billion SEK (£5 billion) — to worries about education. The country’s schools have gone from leading the world to languishing in league tables of industrialised countries. An influx of refugees — 163,000 asylum seekers arrived in Sweden in 2015, a higher proportion of its population than almost any other European country — has been used by the far-right to drum up broader fears about immigration. And a recent spate of shootings, grenade attacks and burned-out cars in many cities has prompted many Swedes to feel afraid of the direction their country is heading in. Election polls suggest a potentially messy outcome. The ruling Social Democrats are likely to be the big losers but could potentially still cling on to power as the centre-right has its own struggles. The winners look to be two parties at either extreme of the political spectrum: the radical Sweden Democrats and the former communists of the Left Party (Vänsterpartiet). Vårgårda is very much a stereotypical Swedish idyll. I drive to the town from Trollhättan, a former industrial stronghold close to the west coast of Sweden, where I had visit the suburb with a high proportion of immigrants that saw several arson attacks on cars. The journey took me past endless miles of forest and the occasional farm. At one stage, I looked into a field of wheat to see a family of four roe deer staring back curiously. Both the Stockholm-Gothenburg train line and motorway both pass through Vårgårda, which houses several big companies including car-parts supplier Autoliv, bathroom supplier Gustavsberg, and pet food producer Doggy. Just as importantly, it is home to dozens of voluntary associations, sports clubs and churches. “We don’t have the capacity to do everything in the municipality. It has to be done by volunteers. Much of Sweden is like this,” says Bengt Hilmersson, Vårgårda’s mayor. The church is at the heart of this. The Uniting Church of Sweden (Equmeniakyrkan) has ten places of worship in the municipality, and there are plenty of other denominations — from the Church of Sweden (Svenska Kyrkan) to Jehovah’s Witnesses. “There’s a lot of hope and not so much fear. The churches don’t mirror how the politics in Sweden are today,” Robert Eriksson, one of the two priests to quiz Kristersson, tells me. That doesn’t mean there aren’t still big challenges. Swedes pay some of the highest taxes in Europe — with a top rate of income tax of 60.1 per cent — in return for a generous welfare state. Known romantically as ‘Folkhemmet’, the people’s home, the Swedish idea of welfare since the 1920s has embraced equality and high levels of free schooling as well as help for those out of work. That system is now under strain. Healthcare and schools are the two biggest voter concerns alongside immigration. Several people I met in Vålgårda grumbled that waiting times for treatment were too long. Hilmersson admits the school results of recent years have been worse than he wants and improving them is tougher than expected. Natalie Tegelberg, a 23-year-old student volunteering for the Christian Democratic Party (Kristdemokraterna) told me that “people lose respect for the politicians if they pay so much and don’t get back what they expect to. We have so high taxes there should be good welfare. It’s less fair if we don’t have this welfare and the ‘Folkhemmet’.” Kristersson says of this election, compared with those of the recent past, that “it’s more about values. It’s more about the very basic competences of the state. Normally we take them for granted and discuss what can we improve even more.” He even goes so far as to argue that there is “a crisis in politics being able to solve problems”. That surprisingly bleak image of a country held in high regard around the world is not because of what is happening in Vårgårda but in Sweden’s main cities. Just under a fifth of Swedes live in Stockholm, Gothenburg and Malmö but they generate a lion’s share of the headlines. Scarcely a day has gone by in the past few years without a shooting, burned-out car, or even a grenade attack being reported in one of these cities. That has upended the usual political calculus in Sweden. Conventional issues around the state of the economy and jobs have seemed less important than normal, to the detriment of the ruling Social Democratic government and prime minister Stefan Löfven. Into the breach has stepped not Kristersson and the traditional centre-right but the Sweden Democrats. Rooted in Sweden’s neo-Nazi movement, the party has tried to shed its racist image, entering parliament in 2010 and becoming the third-largest group four years later with 13 per cent of the vote. A stronger performance than that awaits this time as the party challenges for second — or perhaps first — place. The problem for the Sweden Democrats is that in spite of attracting support from about one in five Swedes (according to the latest opinion polls) none of the other national parties wants to negotiate or even talk to them — because of their neo-Nazi origins. That limits their influence and rules out their chance of joining any government which results. In Vårgårda, as in many municipalities, the local parties do talk with the Sweden Democrats, but do not do deals. “They talk to us under the table. It always starts locally. The next step is national,” says Sunding. The Sweden Democrats’ core message is that Sweden needs to make a choice between immigration and guaranteeing the ‘Folkhemmet’. An infamous 2010 campaign advert of theirs depicts an old woman heading towards a sign offering extra money for pensions, only for her to be outflanked by a group of niqab-clad women pushing prams. “The power of that party is that people are afraid of the future,” acknowledges the centre-right mayor. He points out that the supposed trade-off between immigration and the welfare state is false: Vårgårda has not had to cut any of its services owing to immigration, because it receives funding to deal with that from central government. In this, he is clearly trying to reclaim the issue from the Sweden Democrats. “As long as they can say there is a contradiction between refugees and the welfare state they are comfortable,” he says, “as soon as they have to talk about solutions for things like climate change they are uncomfortable. The Swedish debate has for too long accepted the narrative of the Sweden Democrats.” Swedish officials also believe that Russia has tried to expoit the issue — pushing negative messages around migration and law and order to try to polarise the country even further. 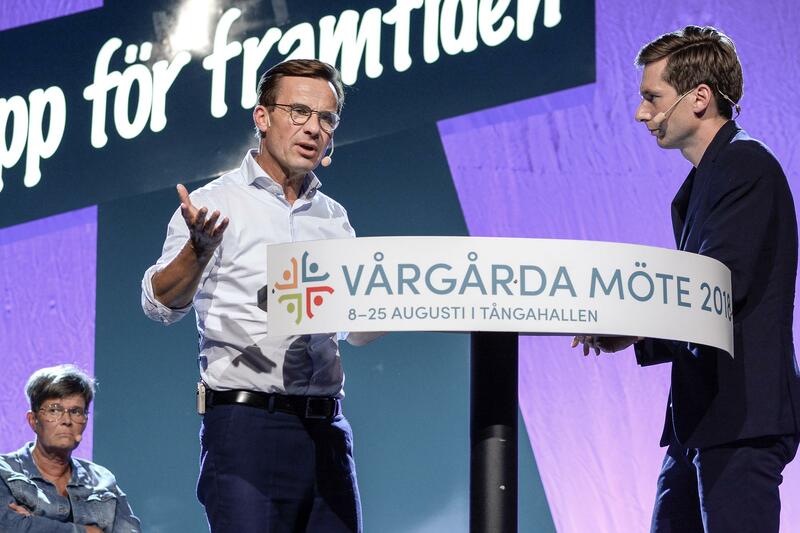 The one time I have seen the Sweden Democrats’ leader look awkward was when Åkesson was in Vårgårda four years ago. Pressed by priest Britta Hermansson about the Christian values he claimed to represent and in particular the duty to help thy neighbour, Åkesson seemed to struggle. “He was not so comfortable. He was defensive all the time,” says Hermansson today. Svensson adds: “It’s easy to say you are a Christian but it has to show in your actions.” Just after the 2014 elections Åkesson went on sick leave due to burnout that some think lay behind his Vårgårda performance. I travel a little way out of Vårgårda to see another of its churches. Storsjöstrand is a modern building, constructed by its members and opened three years ago. Outside it looks more like a sports club with pitches for boules, football and beach volleyball, a Frisbee golf course, and canoes by the picturesque lake. Inside is a room for services where there’s a mixing desk at the back and a drum kit and piano next to the altar; and a bigger room for socialising where I have fika, the classic Swedish break for coffee and cake, with some church members. The Church is involved in work aimed at integration in all of its places of worship, supporting the efforts of the Vårgårda municipality. Åsa Nätterlund, head of a state-run adult education centre that helps three hundred people (half of them immigrants) says integration is easier away from the suburbs of large metropolitan cities. “It’s an advantage of a small community,” she says, “in big cities you don’t see Swedish-looking people often. 85 per cent of people in the Herrgården suburb of Malmö were born outside Sweden, for instance.” Ann-Charlotte Lilja, head of Vårgårda’s social services, says integration has gone well in the town. She even thinks immigrants could eventually help to solve the state’s problem with a lack of public sector workers. “These people are enormously important to cover the gap,” she explains. On the other side of the railway tracks from the council offices, Dahii Ibrahin, a 30-year-old immigrant from Ethiopia, is painting the front of the Mikaelsgården Hotel where he works. In many ways, he is a poster boy for Vårgårda’s integration efforts. He arrived in 2014 without his family after being told in Libya that “Sweden is the friendliest country to refugees”. He spent two years learning Swedish while the council provided him with a home. The labour office sent him to the café and after a week of work the owner, Mikael, took him on. “Mikael is like my father,” Ibrahin says. Back in the sports hall, preparations are underway for another party leader interview: Jonas Sjöstedt, of the Left Party. ‘Hopp for framtiden’ (‘Hope for the future’) is written on the cross on stage. Robert Eriksson, the priest who will sing Joni Mitchell’s Big Yellow Taxi before interviewing Sjöstedt, tells me that the goal in Vårgårda is always to do a different style of interview than the public are used to seeing. So he and Britta Hermansson will talk to Sjöstedt about his diplomat wife, where he comes from, the challenges of being dyslexic, and the problems of his famous temper. “We aim to create a relationship, a trust, so that we can talk. We want them to talk a bit more freely than they do on television.” Sjöstedt draws just over a thousand people, but it is still a big campaign event for him. Ulf Kristersson, bidding to become prime minister, says Sweden’s politics are undergoing a “dramatic change” as it leaves behind a one-party system. “The time is over for one party dominating Swedish politics for decades. It will be a messy time until we end up in a new landscape,” he adds. RICHARD MILNE is the Financial Times‘ Nordic and Baltic Correspondent. Follow election results as they come in at @OnlineFika.